With more than 780,000 new cases diagnosed every year, liver cancer is the fifth most common cancer and the second most deadly cancer worldwide. Men are significantly more affected overall than women. Patients are usually diagnosed with late-stage disease, when no curative therapy is longer available. Then, systemic chemotherapy represents the best available treatment option for these patients. In Europe, the 5-year survival rate is poor, with less than 10%. Hepatocellular carcinoma accounts for 90% of primary liver cancers occurring predominantly in patients with underlying chronic liver disease and cirrhosis. With an estimated 746 000 deaths in 2012, it is the second most common cause of cancer-related death, exceeded only by cancers of the lung (Torre 2015). 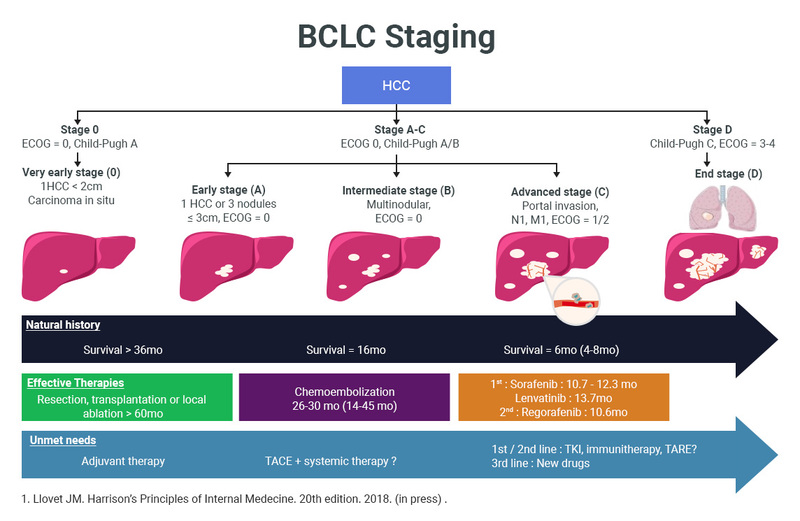 The incidence of HCC on the rise, coupled with a high mortality rate worldwide and limited therapeutic options at advanced stages, makes HCC a significant unmet medical need. Without treatment, HCC progresses rapidly, with the median survival of patients with advanced disease between 4 and 8 months; patients with terminal stage disease have a median survival inferior to 4 months(Verslype 2012). Approximately 60% of HCC patients are diagnosed with intermediate or advanced HCC (Altekruse 2009, Cabibbo 2012, Park 2015), when treatment options are limited (Shin 2013). In addition, the recurrence rate is 50-80% even in patients with earlier stage disease eligible for resection and transplant, the majority relapsing within 2 years. Early recurrence after resection is associated with a dismal prognosis, reducing 5-year survival rates from 70% to 30% (Kim 2015). Recurrence is also observed in patients undergoing liver transplantation (Mazzaferro 1996, Portolani 2006). The current standard of care for advanced HCC is Sorafenib, a small molecule rapidly accelerated fibrosarcoma (Raf) and vascular endothelial growth factor receptor (VEGFR) kinase inhibitor, approved in 2007 for the treatment of patients with unresectable HCC. Sorafenib increased median time to tumor progression from 2.8 months for the placebo group to 5.5 months (p<0.001). Recently, Regorafenib was approved for use in patients with HCC previously treated with Sorafenib, based on results from the RESORCE clinical trial (Bruix 2017) . In this trial, patients taking Regorafenib had a median overall survival of 10.6 months vs 7.8 months for placebo plus best supportive care. Sorafenib and Regorafenib are multi-target inhibitors sharing similar mechanisms of action related to the inhibition of Raf, VEGFR1-3, and platelet derived growth factor receptor leading to inhibition of cancer cell proliferation and tumor angiogenesis. For patients with advanced HCC, Sorafenib and Regorafenib provide minimal clinical benefit with the modest extension in median overall survival and primary resistance or intolerance to these drugs remains a significant issue. Intrahepatic cholangiocarcinoma (iCCA) is a rare malignant tumor of the biliary tract with growing incidence and dismal prognosis. It is the second most important primary liver malignancy, which adds up to 10-20% of primary liver cancer diagnosed globally. It may occur in normal liver or with underlying liver disease, and in these cases, it appears as a mixed type hepatocellular-cholangiocarcinoma instead of traditional adenocarcinoma. Several risk factors of chronic inflammatory damage and increased cellular turnover have been established, such as hepatobiliary flukes (Opistorchis viverrini and Clonorchis sinensis), primary sclerosing cholangitis, biliary tract cysts, hepatolithiasis and toxins (Khan 2005). ICC early diagnosis is still a major challenge since patients with early stage disease are often asymptomatic. Cirrhosis, chronic hepatitis B and C, obesity, diabetes mellitus and alcohol liver disease are known risk factors for HCC and they are emerging now as warning conditions for ICC as well (Palmer 2012). There is a growing interest in suspected association with inflammatory bowel disease and smoking, and even for defining the role of genetics polymorphisms. The only potentially curative treatment option for patients remains surgical resection. Unfortunately, even after curative-intent surgery, the clinical outcomes of patients undergoing liver resection are disappointing, with a 5-year survival rate of 25% to 40%. Furthermore, the role of adjuvant therapies, including systemic chemotherapy and radiotherapy, remain poorly defined and have been reported to have only a modest therapeutic effect. The 5-year survival rate drops to 5-10% in the advanced and unresectable setting (DeGroen 1999, Ramirez Merino 2013). 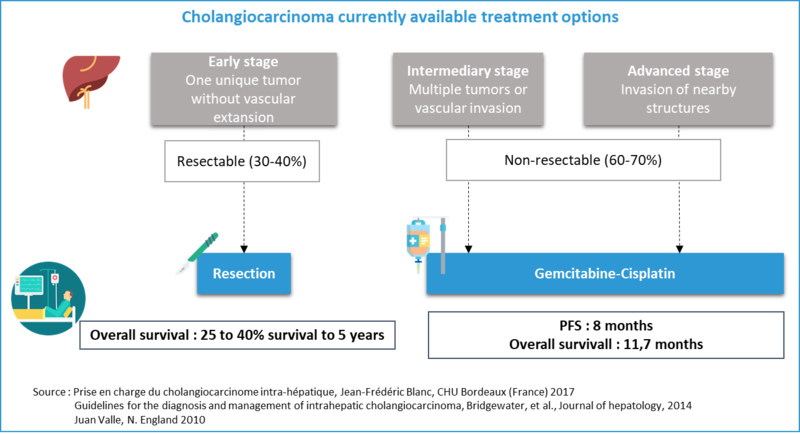 Chemotherapy is the standard of care for patients with advanced or recurrent cholangiocarcinoma, with gemcitabine-platinum combinations, and other gemcitabine- or fluoropyrimidines-based regimen being the most commonly used (Eckel 2007, Valle 2010). The combined use of gemcitabine with platinum agents, such as cisplatin or oxaliplatin, have been shown to improve survival outcomes compared to gemcitabine alone or to 5-fluorouracil /folinic acid (p < 0.001) in meta-analysis reported by Yang et al (Yang 2013). Several phase 2-studies evaluating the activity of the gemcitabine-oxalipatin combination in the first-line setting proved modest efficacy in patients with advanced cholangiocarcinoma, with median progression-free survival and overall survival of 3.4 and 8.8 months respectively in the whole population, and 3.8 and 11.0 months respectively in the non-gallbladder population (Andre 2008). Some others studies are ongoing with nivolumab, therapeutic vaccine, ALK inhibitor, Met inhibitor, humanized monoclonal antibody, paclitaxel and 90Y transarterial radioembolization, but the need for novel therapies with original mechanisms of action is also warranted in this cancer. The exact definition of the origin of this disease is still a challenging and unsolved matter. However, more recent researches suggest that mature hepatocytes, hepatoblasts and undifferentiated bipotential stem cells can produce a wide range of tumours, ranging from cholangiocarcinoma to HCC (Fan 2012, Gibiino 2017). Would you like to meet us ?